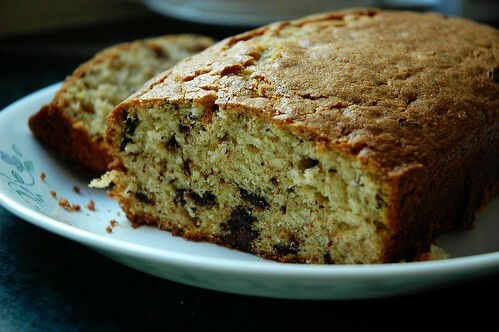 Lemon & Chocolate Loaf Cake – o frabjous day! Man, I love this cake. It’s so lovely and light and moist and generally the bomb – also I think you could substitute nuts or cranberries or… other things for the chocolate and you would get a completely different cake-vibe. Man. How articulate. Recipe is from an old Women’s Weekly cookbook. Cream the butter, sugar and lemon rind together until it’s all creamy and fluffy. Beat in the eggs. Mix in the chopped chocolate or bits of nuts or dried fruit or whatever you’re in the mood for. Mix in the flour alternately with the sour cream (although I never bother to do it alternately, I just chuck it all in and stir away. Perhaps this cake would be even more marvellous if I bothered alternating). Stir, stir, stir. When it’s all well mixed, pour into a lined loaf tin (yes, line it, this cake needs lining). Bake for 50 to 60 minutes and test with a skewer. While the cake is still warm and in the tin, top with a mixture of lemon rind and sugar so that it melts a little into the cake. Turn out onto a plate, slice while still warm, and enjoy the lovely lemoniness.